This entry was posted in Uncategorized on 31/01/2014 by admin. Kate’s Originals are now available at Geoffreys based in the South of France. This entry was posted in News, Stockists on 19/09/2013 by admin. 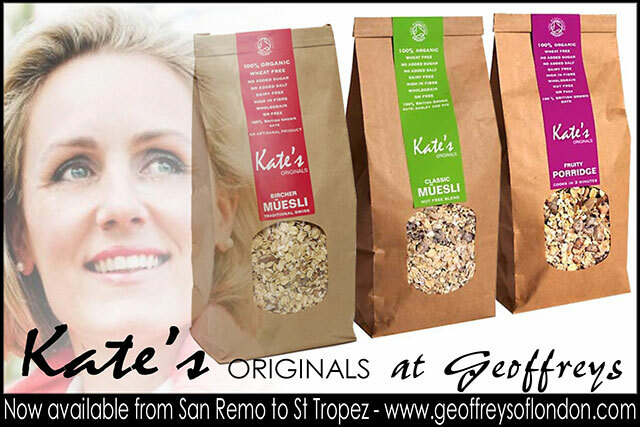 Find Kate’s Classic Müesli in the Food & Wine online department and visit the Pantry. Kate’s is currently available in all Harvey Nichols stores nationwide (6 branches) but if you prefer to shop online or don’t have a store near you ordering online from HN couldn’t be easier. Meet Kate instore at a free tasting session soon, dates to be posted very soon! This entry was posted in News, Stockists and tagged Harvey Nichols, muesli on 16/04/2013 by admin. 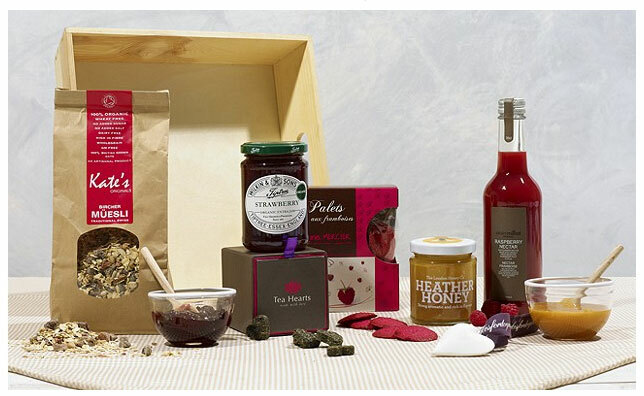 Treat your mother to a luxurious breakfast and other fine foodie gifts in this special Hamper selection from Harrods. Containing Kate’s Originals Bircher Müesli, packed with fragrant strawberries, apple and 100% British farmed grains. visit www.harrods.com or order in store at Knightsbridge. This entry was posted in Stockists and tagged 100% British, Bircher Müesli on 28/02/2013 by admin. Exciting news! Harrods launch Kate’s über-special Bircher Müesli as part of their Harrods Hamper selection. The Valentine’s Breakfast-Tray Hamper includes Kate’s Bircher Müesli and makes the perfect foodie gift for your Valentine. Start your day as you mean to go on with the Breakfast Tray from Harrods. Kate’s Bircher Muesli, honey and tea are just a few of the delicious items included. Presented on a wooden breakfast tray this hamper is a true delight that anyone would love to wake up to. £75.00 from www.harrods.com available now! Harrods Food Hall stocks the full range of Kate’s Originals. Classic Müesli is also available in Harrods Hampers. This entry was posted in Stockists and tagged Harrods on 25/01/2013 by admin. Kate’s is currently on 15% promotion throughout January in Wholefoods Market stores nationwide. This entry was posted in In the Press, News and tagged HFG's Porridge Best Buy on 14/01/2013 by admin. Enjoy a Goldilocks-perfect bowl of Kate’s Pure Porridge at Partridges Cafe, Duke of York Square. The finest 100% British farmed organic jumbo oats specially selected by Kate make the most delicious porridge you will taste with a perfect creamy texture whilst retaining an al dente bite. Porridge doesn’t get better than this! Partridges serve Kate’s Originals porridge plain so that you can add the topping of your choice as well as offering a winter berry selection. Partridges cafe is the perfect place to soak up the seasonal atmosphere both in their beautiful outdoor cafe and indoors where you’ll find gorgeous foodie treasures for family and friends. On a Saturday morning enjoy breakfast at Partridges so you can make the most of the food market in the square. A warming bowl of Kate’s porridge will give you the perfect start! This entry was posted in Stockists and tagged 100% British, porridge on 30/11/2012 by admin. Kate’s Originals can now be found in the food halls of Harvey Nichols stores nationwide. Please see stockist list for details of your nearest store. You can meet Kate in Harvey Nichols, Knightsbridge at a tasting session – date to be announced soon! This entry was posted in Stockists and tagged Harvey Nichols, muesli on 15/11/2012 by admin. NEW! Kate’s Birchermüesli – Traditional Swiss – available in Harrods today! My new überspecial Birchermüesli is on sale from today in the Harrods Food Hall – luxury grocery department. For me, this is where my passion for müesli really began. My Bircher Müesli is packed with 100% British grown oats, strawberries, almonds, apricots, dates and nutritious seeds. Simply enjoy as you would any other müesli with cold milk (I prefer goats milk) or for a true Birchermüesli soak in orange juice, natural yoghurt and add grated apple, pear, half a banana and any other fruits you might prefer. Purists often add cream or a zest of lemon and a sprig of mint to serve. Traditionalists even use evaporated milk. You choose your preferred method – every Swiss family has their own Birchermüesli style! It’s “Gemüeslich!” as I would say! This entry was posted in Uncategorized and tagged Harrods on 21/07/2012 by admin. Harrods Food Hall launch Kate’s Originals today! Make eating the most delicious and nutritious breakfast you can find a good excuse to visit the Harrods Food Hall today. Located in the Food Hall you will find Kate’s Classic Müesli and Kate’s Fruity Porridge and a very exciting new addition joining them any day soon! All of my products are made using 100% British grown grains and it’s great to launch into Harrods at such an exciting time for Britain. Enjoy the fabulous food hall of Harrods! This entry was posted in News, Stockists and tagged Fruity, nutritious on 17/07/2012 by admin.